I have been wanting to publish, or make available, the genuine workshop details about a subject much misunderstood, or we simply do not have the knowledge to get the system to work properly. Of course, it doesn't help if parts are no longer available, or alternatively, are priced at such levels that you really have to ask yourself as to how you can keep your car running. Part 2 deals with the various suspension elements. 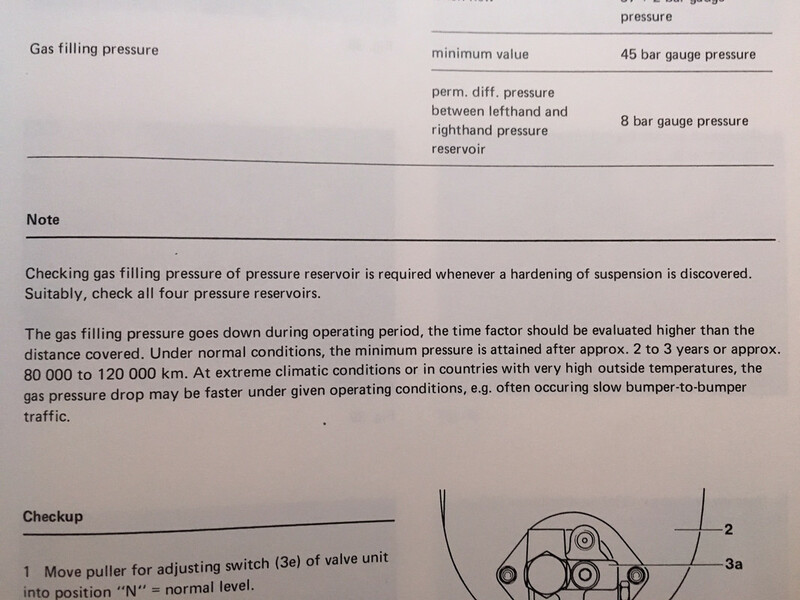 Part 4 hydropneumatic suspension details. Definitely of interest! Thanks Styria! 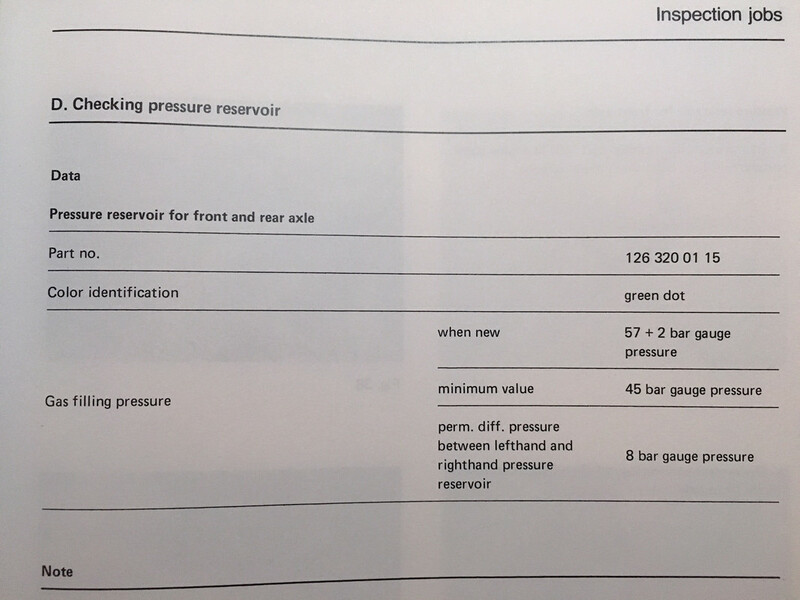 Interesting differences between the W116 and W126 systems.... 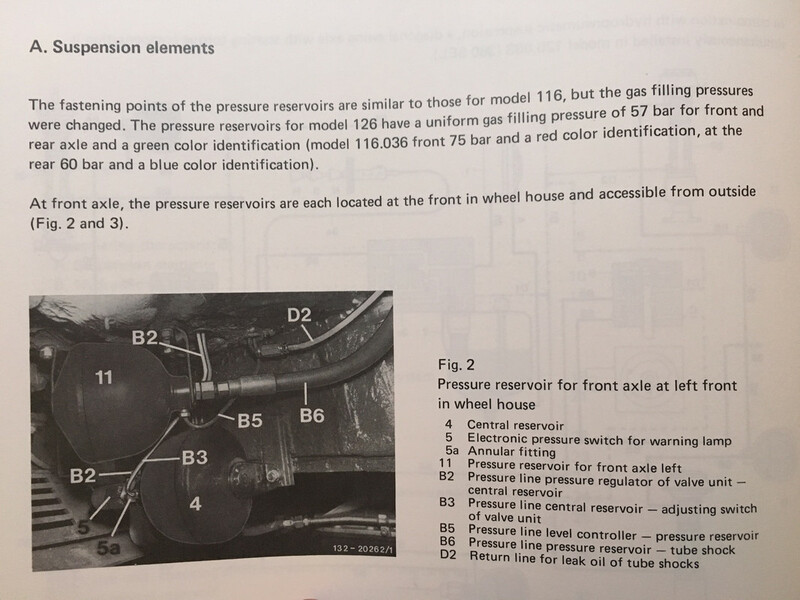 I'm wondering how a W126 would handle with W116 gas cells?? The front and central cells on a 6.9 run at a higher pressure than the W126 ones (red vs green) so I doubt they have been superseded. The red cells were specified for the heavier M100 engine. The W126 with the lighter M117 engine has green cells for all 5. 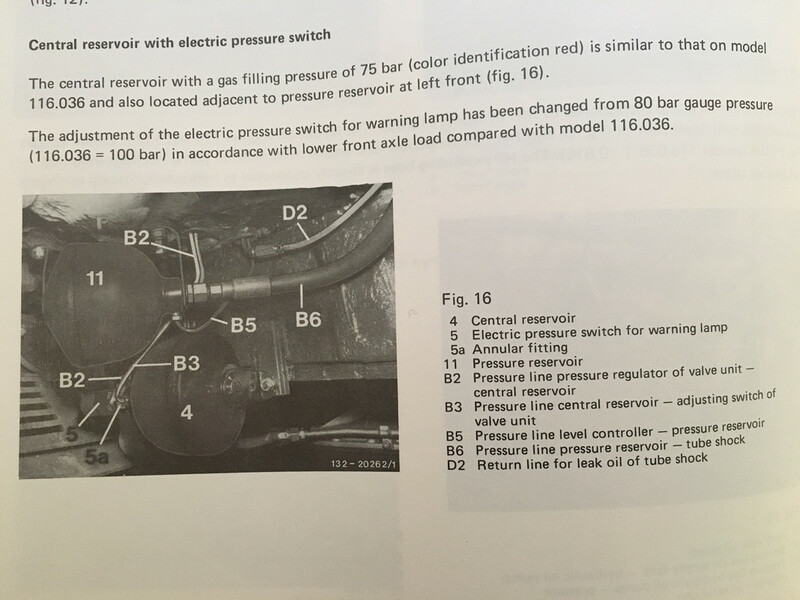 Hence my question about how a W126 might behave running red 6.9 cells on the front? Would it be similar to the 'sport' struts that were once available? I used to think a regular car's suspension was pretty simple to understand. The steel springs control the ride height depending on the weight involved and the shock absorbers control the movement of the spring in bump and rebound. However is gets more confusing with a progressive rate spring which changes tension as it's compressed. A little like the cells in a hydro system which increase spring rate as they are compressed. I'd have thought this would reduce body roll over and above the standard 450, however the 6.9s stabiliser bar is actually bigger than a standard one! Perhaps it's simply due to the valving arrangement which might allow fluid to move from one side to another during cornering? Seriously ,they have been superseded,they do the same job, , when you say higher pressure where do you get specs for gas pressure in the cell ? I was slightly incorrect; the W126 uses 4 green cells and one red (central) cell. I'm going by memory that the W116 uses 3 red cells (front and cetral) and 2 green (rear). On Citroens, where this system basically came from, each car specifies different spheres for front/rear and the cars ride like crap if you use the wrong ones. Also, Safaris (wagons) have different rears to the Berline (sedan). Its a shame the fittings are different as the throwaway spheres are cheap and the older ones are rebuild-able. Interesting the spec on the scan there is almost identical to the DS front sphere which is 59. The big difference is Citroen's are heavily weight biased to the front. I have no knowledge of the Mercedes ones, I have never had a full hydro Mercedes. This part is interesting because it compares the 116 & 126 cells. Even more interesting is it mentions blue dot cells on the rear of a 6.9. I'm guessing NLA since the pressure differences weren't that great.